Although it is not usual, you can also cook paella in the microwave. The procedure is different from the traditional way, but the result is quite good, especially if you don’t have too much time to do it. 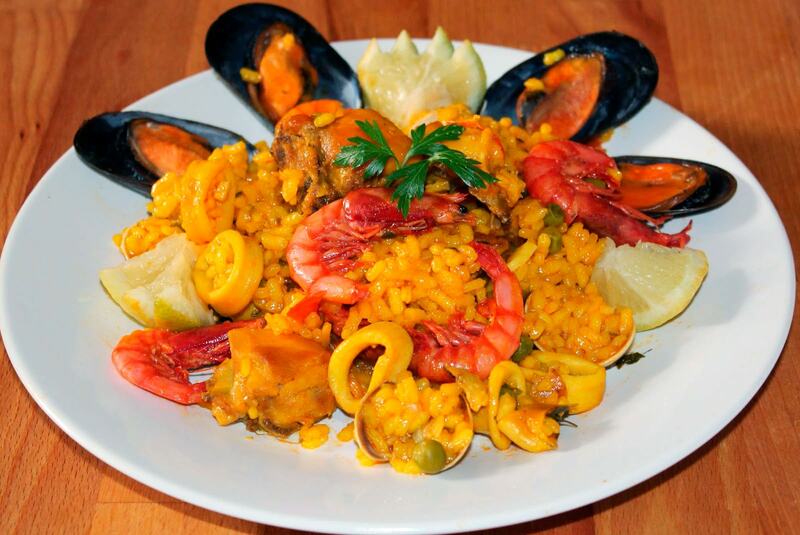 The keys to a successful paella are: quality ingredients, especially a good paella rice, adequate cooking time, a good sofrito and final resting time. And with this microwave method, we have all of them. Before starting the paella in the microwave, we must have the mussels well washed and without beards. Peel and finely chop the onion and garlic cloves. Place them in a microwave-safe container, cover, and place in the microwave for 5 minutes at maximum power. In the container, pour the rice, the very hot broth, a pinch of saffron, the oil and the salt, cover it and put it in the microwave for 20 minutes at maximum power. Meanwhile, cook the mussels in a casserole with a little water until the shells open. Drain them and remove the empty shell, reserving only the full shells. Next, cut the chicken into pieces and cook it in boiling water for a few minutes, until it is tender. Blanch the tomatoes in boiling water for 3 minutes, refresh and peel. Cut them in half, remove any seeds we see and cut them into small cubes. When the 20 minutes of cooking is over, place the peas in another microwave safe container, cover it and place it in the microwave for 3 minutes at maximum power. Now add the cooked and peeled prawns to the peas, together with the cooked chicken and chopped tomatoes. Cover them and put them in the microwave for 5 minutes at maximum power, stirring it halfway through cooking so that everything heats properly. Next, drain any liquid that may have been released, and mix the ingredients above with the rice that is already cooked. Taste and correct seasoning if necessary. To finish this paella in the microwave, put the 4 prawns as a decoration on top and serve with a few slices or lemon wedges. And there you have it! A Spanish Paella in the microwave! Wasn´t it easy? Paella with chicken and seafood, so tasty!